Never in a million years did I think I’d find myself glamping in Arizona on a peach farm, but I did it, and you can too – at Schnepf Farms in Queens Creek, just outside Mesa. Schnepf Farms has a super cool collection of renovated and uniquely decorated vintage Airstream trailers for guests to stay in on their farm, and as part of a Mesa, AZ press trip, I found myself opening the door of a 1948 “Spartan Manor” Airstream to see a luxuriously outfitted and cozy trailer with everything I could possibly need while camping… I mean glamping in Arizona. 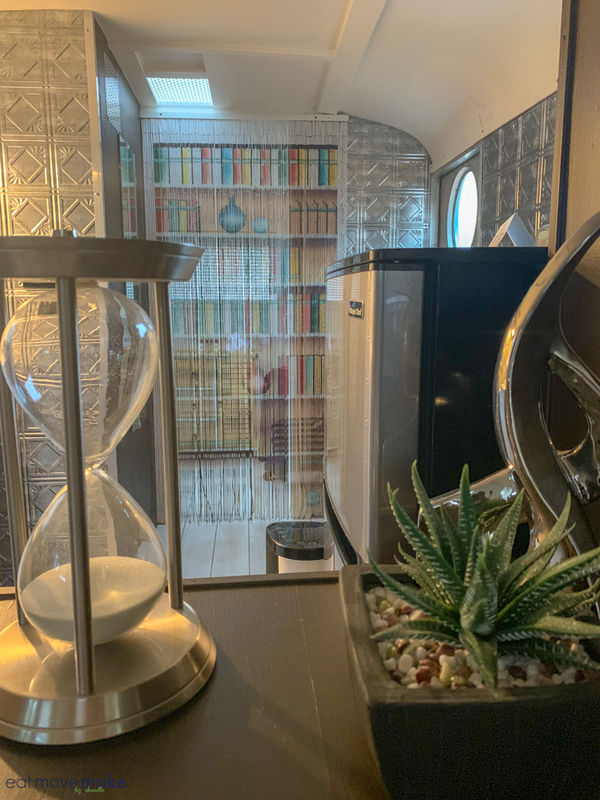 I love being outdoors, but I have no desire to sleep outdoors, so luxury camping inside a glamping trailer with a big comfy bed, a shower, toilet, fridge, microwave, TV, heat, A/C and electricity is exactly what the good doctor ordered. View from the bed. Bathroom with shower is behind the “bookshelf”. Just outside the trailer is a private patio, with grill and seating. Fun! 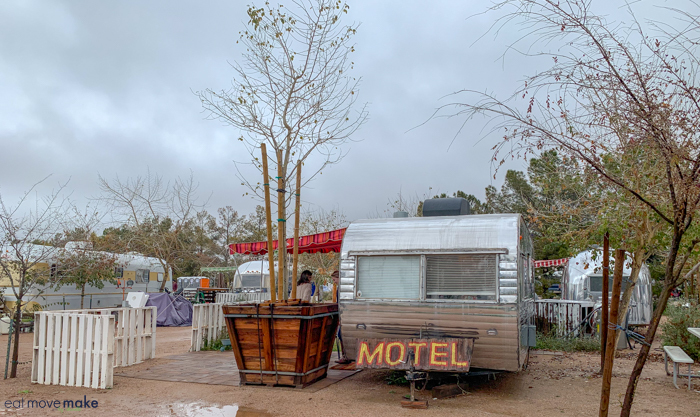 The glamping trailers are all refurbished uniquely so each one offers an entirely different experience. 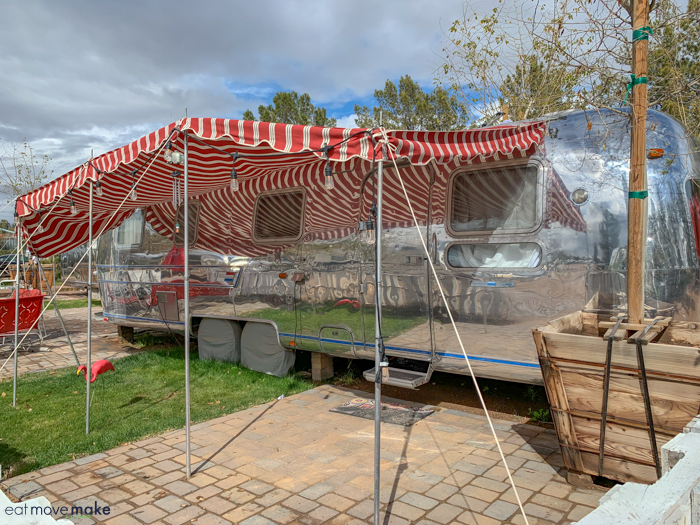 Since the trailers are all parked in a court, it would be a great place to get together with friends or have a family reunion. 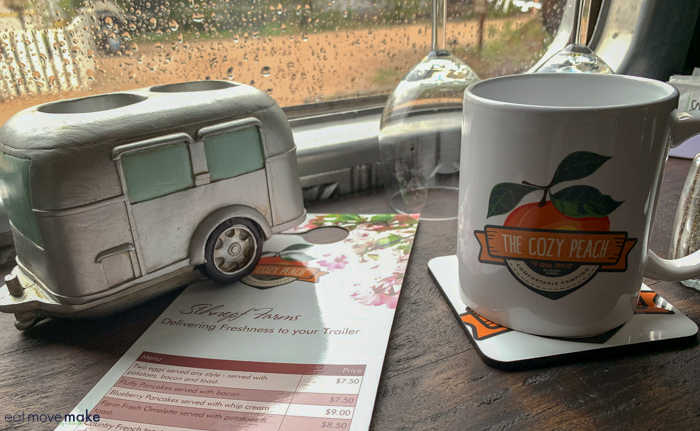 My favorite perk of staying at The Cozy Peach was “trailer service” – breakfast delivered right to the door of your trailer in the morning! Fill out a breakfast order form and hang it outside your trailer the night before with a desired delivery time. Glamping at Schnepf Farms gives you the chance to participate in all the farm activities too, and believe me, there’s a lot to explore. 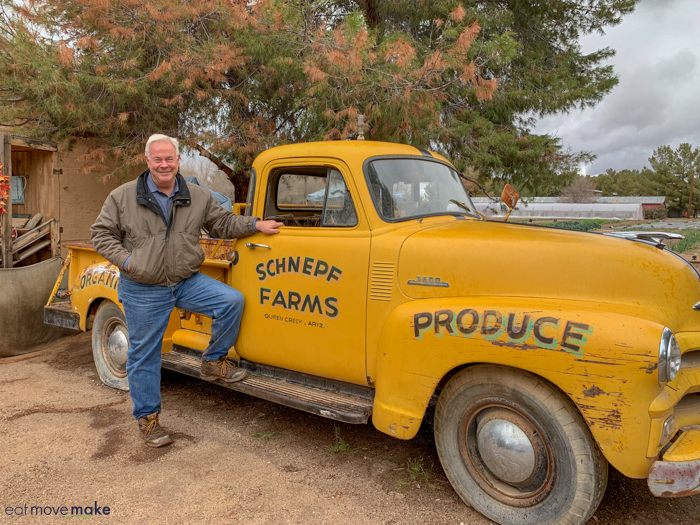 By the way, if you want Schnepf Farms’ fresh peaches, you can only get them on the farm. They sell out every year! 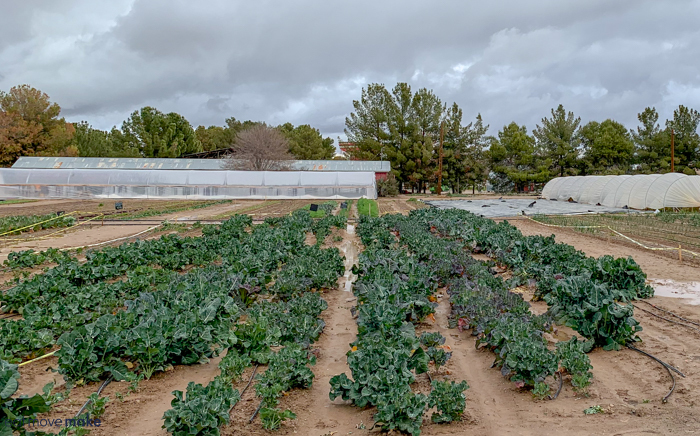 One fun farm activity is pick your own fresh flowers or veggies from the certified organic fields. There’s always something ready for picking on the farm! Pay by weight for produce and by the stem for flowers. Sunflowers and lavender are especially popular at Schnepf Farms. Keep an eye open for special lunches where you pick your veggies and learn how to cook them too. It’s a great way to get familiar with things like turnips, beets and collards. Guests can also hop on bikes and cruise around the farm at their leisure. One fun hideaway is a secret library in the pine tree forest with Adirondack chairs, books and a hammock. 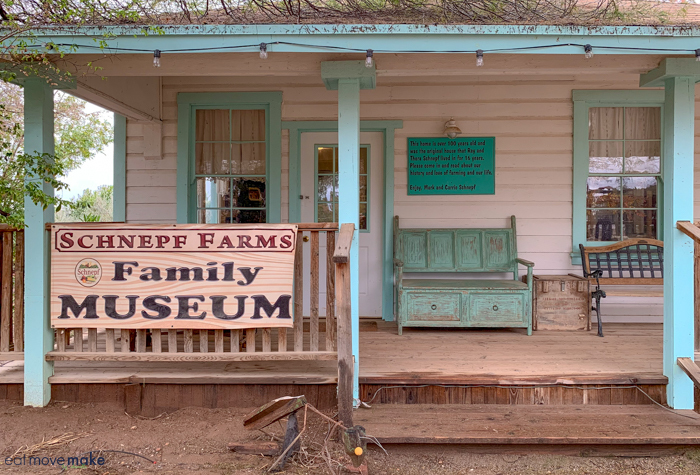 There’s also a neat little Schnepf Farms family museum right across from the u-pick fields. 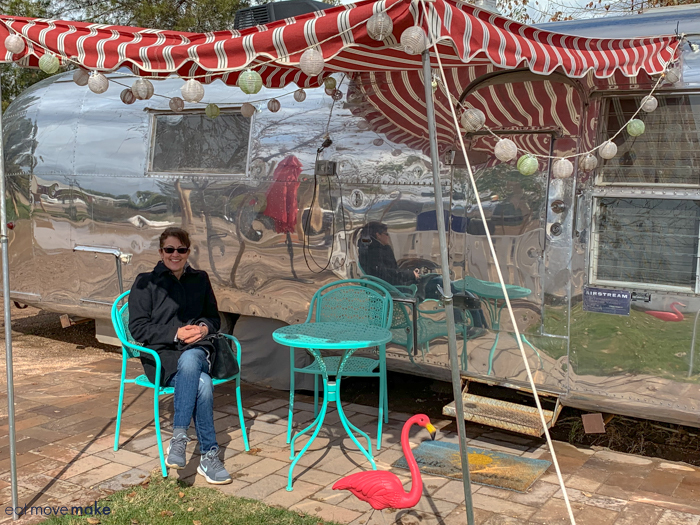 And if photo opps are your thing, there’s a neat old truck and vintage carousel (the oldest in Arizona) on the property. Owner Mark Schnepf with the family truck. 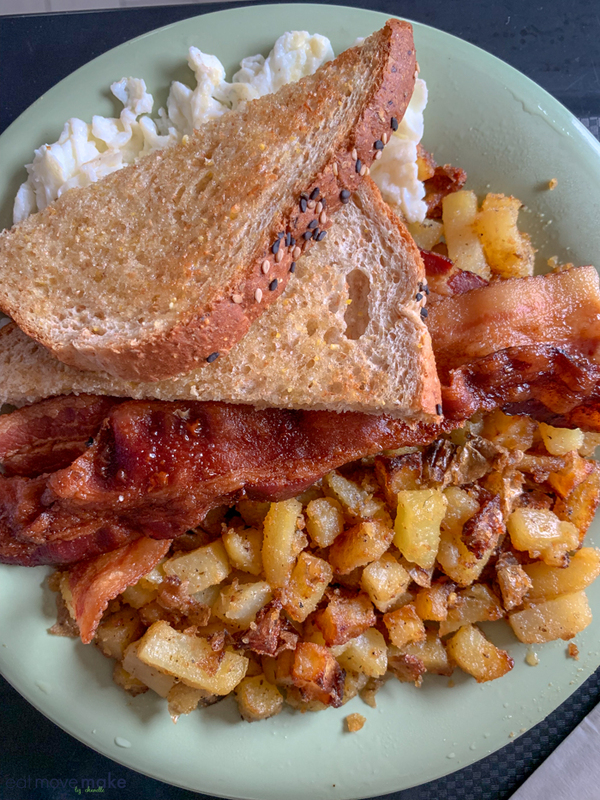 If you’re looking for delicious baked goods and treats, be sure to visit the Farm Fresh Cafe and Bakery. 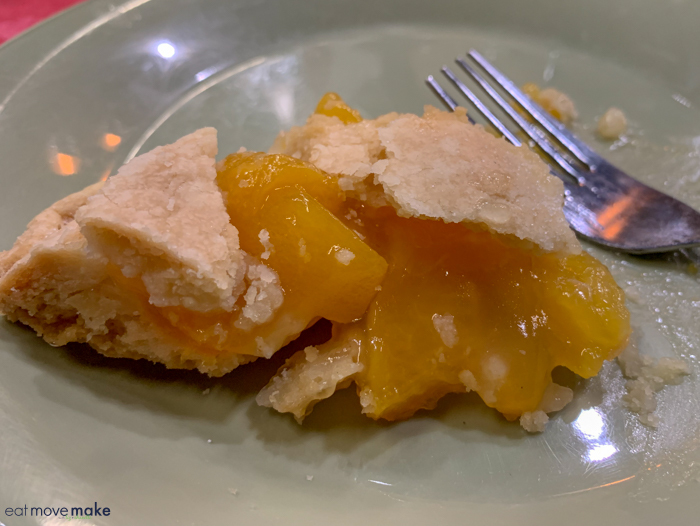 I tried peach pie, peach cinnamon bread and peach fudge. Oh, so good. For family fun, there are vintage amusement rides, a train, petting zoo, and a corn maze and ice rink, seasonally. 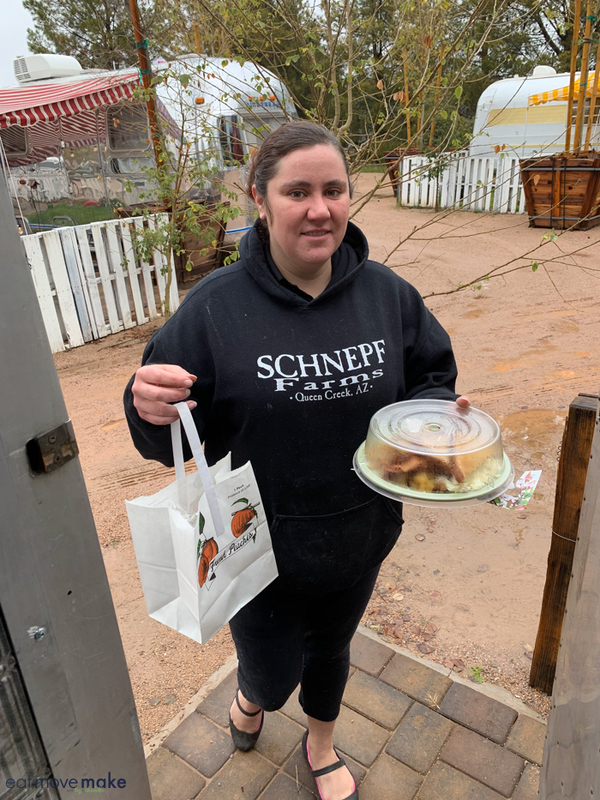 It’s no wonder Schnepf Farms is a popular place for families! 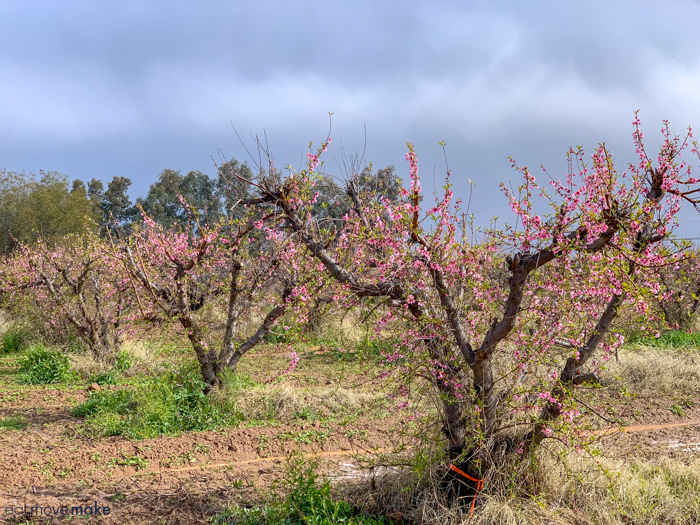 Glamping in Arizona on a peach farm sure sounds fun, doesn’t it? And pssst, future plans call for a luxury boutique hotel and treehouses. 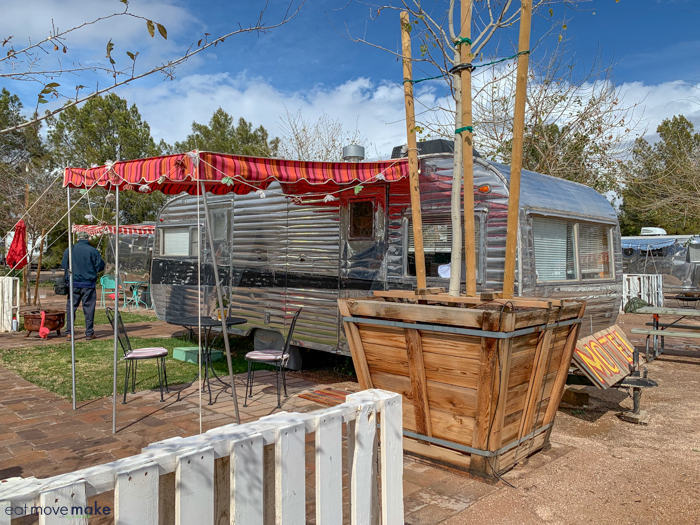 Put glamping in Arizona on your bucket list, and book a stay at the Cozy Peach at Schnepf Farms today. It’s an experience you’ll never forget! Connect with Visa Mesa to make travel plans to the area. 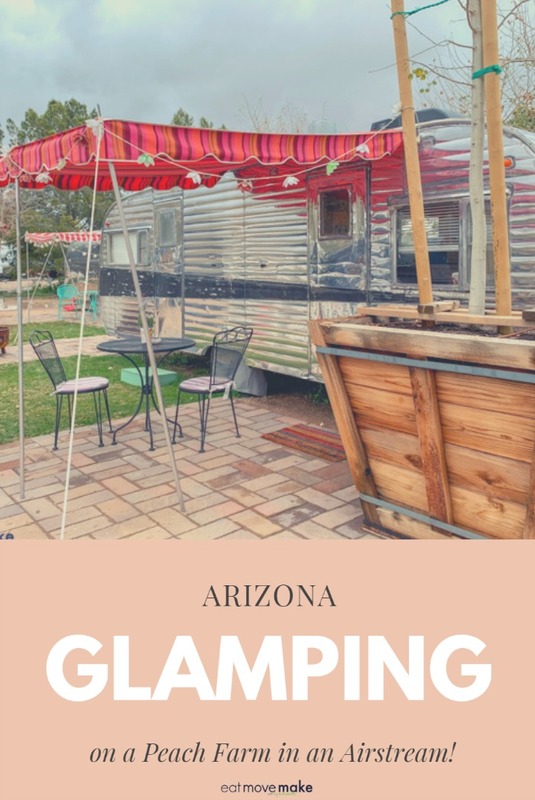 Pin this glamping in Arizona post for travel inspo! I prefer glamping than camping. I love how cozy this looks, it surely is fun! What a beautiful experience! 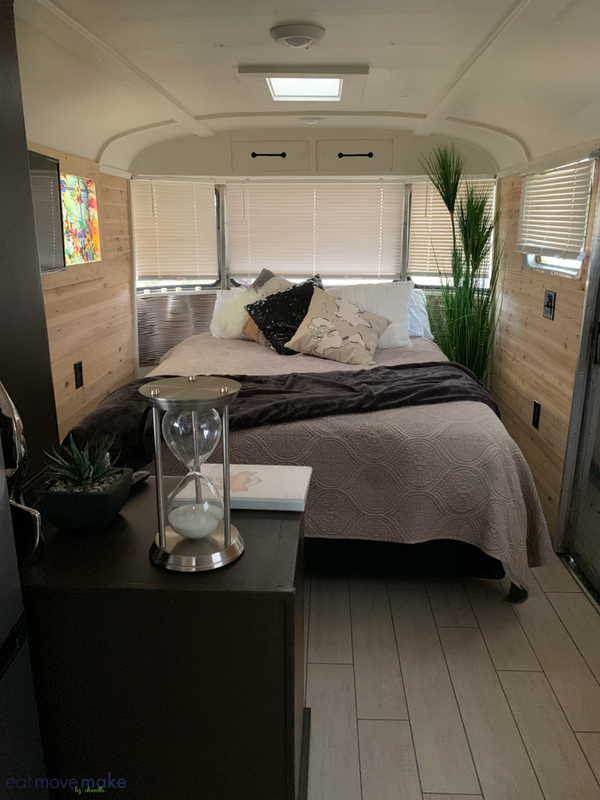 I would like to have the opportunity to live for a day in a glamping trailers. Oh my goodness this would be husband’s dream come true! How beautiful and fun! Thank you for sharing! Now THAT’s the way to camp! 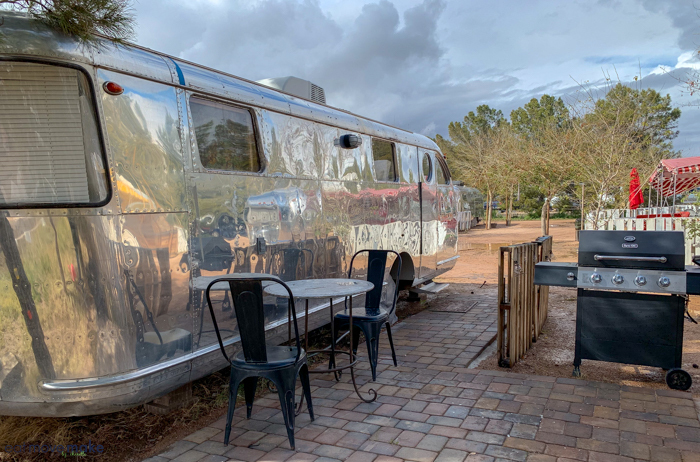 I love old Airstreams, especially when they’ve been redone like that one! Now this is my kind of glamping! It looks like such a fun vacation. I’m definitely adding this to my travel list! Now that would be a fun family vacation! We don’t mind camping, but, why not go glamping when you can? This has to go on our list of vacation spots!